Often called “a citizen writer” like her friend and mentor Wallace Stegner, Terry Tempest Williams is one of the foremost explorers of the American landscape. Raised and still residing in Utah, she has penned more than a dozen books that imply a blurred division between the worlds of nature and humanity, a cleft leaned heavily upon by a previous generation of literary naturalists. Her 1991 memoirRefuge that brought her international acclaim parallels the death of her mother with the flooding of the Great Salt Lake as an examination of loss and grief. A 2004 essay collection, The Open Space of Democracy, offers of a vision of citizen engagement yoked to an engagement with natural places. 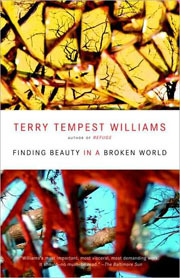 In 2008, Williams published Finding Beauty in a Broken World, an associative tessellation of genocide, the endangered prairie dog, and mosaic making, each bowing towards the question embedded in the book’s title. 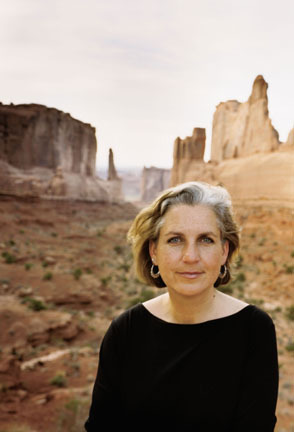 In 2006, Terry Tempest Williams received the Robert Marshall Award from The Wilderness Society, their highest honor given to an American citizen. She is currently the Annie Clark Tanner Scholar in Environmental Humanities at the University of Utah. I spoke with her in a hotel room in San Francisco, where a large picture window captured the region’s legendary fog lifting off the shoulders of Mt. Diablo. Kevin Smokler: I’m particularly interested that we’re having this conversation in San Francisco, a major metropolitan area that has enormous reverence for the natural world. The boundaries of the city were redrawn by the 1906 earthquake and pretty much left that way. It’s also where much of the established environmental movement—The Sierra Club, for example— calls home. And yet at the same time it is a place of change and innovation. It seems like a place where the soul of how we regard the environmental movement is being played out. Terry Tempest Williams: I think that’s so true, and you can even see it structurally with the new building at the California Academy of Science. It’s the most green building in the world. You stand on the roof with these beautiful mounds, with these holes that allow light to trickle down, with all these different elevations, and it allows you to forego your perspective as a human being and almost see yourself as other. I just loved it. KS: How do you see that building as connecting the older version of environmentalism, which focused on the protection of open spaces, and the “bright green” environmentalism being pushed by Silicon Valley, the idea that brainpower and technology can create a greener, more sustainable world? TTW: Well, I think the California Academy of Science embodies that, because they erased the old buildings, they reduced their physical footprint as well as their carbon footprint. But they kept the wonderful brass seahorse banister that you still hold onto as you ascend and descend, and many of the old dioramas are still there, again almost a museum within a museum. So they’ve built on the tradition that was there, but they have far surpassed it into a wider, broader conversation. KS: I bring this up by way of talking about your new book, Finding Beauty in a Broken World, which has the metaphor of a mosaic at its center. I don’t know if it was coincidental that this book came out in the waning months of the Bush administration—would it have had the same title if it came out six months later, with this renewed sense of hope so many have with the Obama presidency? TTW: I’ve always believed that books come out when they are needed. This has been an eight-year project; I work slowly, and it was fascinating traveling around the country after the book came out because half of the tour was during the Bush administration and the other half was when Obama had been elected president. With both administrations, we are being asked to think about how we repair what’s been broken in these last eight years—in terms of environmental policy, in terms of social discourse, in terms of the very act of a democratic society. How do we create beauty in a broken world? How do we create a view of sustainability in an economy that is crashing? 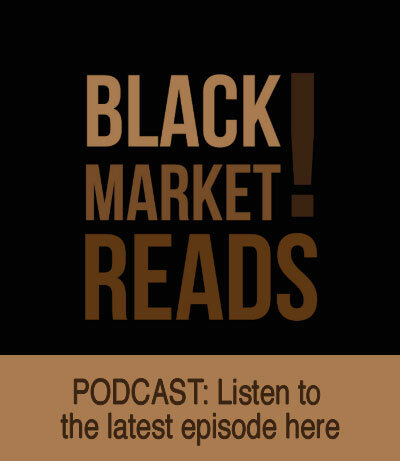 How do we reconfigure our lives, how do we pick up the pieces and create a meaningful life? So, yes, we have a different form of leadership but the questions remain the same. That whole year, I was writing op-ed pieces, and I had essays that were canceled because people felt they were too unpatriotic given where we were. But, as I’ve said before, I realized my rhetoric was becoming as hollow and brittle as those I was opposing. In one conversation with my father, I was ranting and he walked out of the room saying, “Why don’t you talk to me when you have something interesting to say?” I realized I had lost my poetry, and I wanted it back. Sometime later, we were in Maine. I took a walk to the ocean where I called out a prayer: I said, “Give me one wild word. . . .” And the word that came back to me was “mosaic.” What I love about the creative process, Kevin, is that I could never have imagined, never, that that one wild word would have led me to Italy to study mosaics in Ravenna, would have allowed me to see my own home ground differently, would lead me to the fate of the prairie dog and see my own country an ecological mosaic, broken and beautiful, and would ultimately, lead me to Rwanda to create a genocide memorial, a mosaic, literally from the rubble of war. KS: You’re very proud to be an American, aren’t you? That was, until recently, a very unfashionable thing to say in left-of-center circles, but I get the sense that it’s part of the fundamentals of who you are. TTW: Well, we are Americans. I’ve always believed that you work with where you are—I am a Mormon woman who was raised on the edge of the Great Salt Lake in the American West in the United States of America. But, by the same token, much of my life has been spent resisting traditional forms of democracy, resisting traditional forms of orthodoxy, be it the United States government or the Mormon Church. I come from a devout Republican, Mormon family—my father’s the Marlboro man without the cigarette—and growing up, the conversations around our dinner table were anything but peaceful. You know, the Endangered Species Act was shutting down my family’s pipeline business and I was advocating the rights of the desert tortoise. It’s a complicated history and it’s a paradoxical history. I’m proud to be an American but the United States government has largely decimated my family through nuclear testing in the 1950s and ’60s. Nine women in my family have all had mastectomies and seven are now dead. My brother passed away from lymphoma in 2005, one of five men under age fifty to die from blood-born cancers in their neighborhood. We have a history of betrayal with this nuclear legacy that is not so unlike that of native people in the American Southwest. I’ve chosen not to avert my gaze—I question my religion, I question my government, but I acknowledge that I come from both. KS: Patriotism is a kind of love, and love is a complicated thing. TTW: I love this country. I love it physically, and I love what it attempts to be, and I think we’re now in this resurgence of “what does it mean to engage in a democratic society with our highest and deepest selves?” I was at Obama’s Inauguration and I still have trouble talking about it. For eight years, so much of what we value in terms of public lands was vanishing in Interior West. You look at Wyoming and it’s an open wound because of the oil and gas development. You look at parts of Utah, it’s the same thing. And I kept thinking, “Why aren’t we in the streets? But on Inauguration Day, Kevin, I realized we are in the streets, and now it’s about saying, “What can we create together with this new President who is asking [us] for sacrifice and service?” So I think it’s an incredible transformative moment, though we arrived here out of heartbreak. KS: How do you imagine the next four years? TTW: As a series of peaceful uprisings. I think now is the time when we really need to work hard to make sure that these ideas about constructive social change culturally, ecologically and politically, come to pass. And that’s only going to happen if people support the leadership, because the same power structures are still in place, and it’s not in their best interests to change. It may be that we need to be really creative about what civil disobedience looks like under the Obama presidency. As a nation, we are saying, “We don’t know what to do because we’ve never been here before and the old forms are no longer working for us.” And, in many ways, I think this is what I was working with artistically with this book. Structurally, I did away with chapters and traditional headings; gone. I un-moored the entire text during the last six months of writing the book; I realized, “I don’t need to call this book ‘Mosaic,’ I need to create a mosaic.” My life doesn’t have beginnings, middles, and ends; it’s a continuum. And that’s what I wanted the book to be—a mosaic made of words with fragments: stories, newspaper clippings, poetry, political discussions, biological discussions, and a running narrative between three landscapes; Italy, Utah, and Rwanda. I took some risks. There’s a hundred pages of prairie dog notes, and my editor said, “You cannot write a book with a hundred pages of prairie dog notes.” But I wanted the readers, if they were willing, to enter that landscape of witnessing and I wanted them to be as bored and out of their minds as I was those first three days of field work, where it’s like, “Oh my god, there’s nothing happening here.” But as I slowed down, the world revealed itself in the most wondrous ways, and prairie dogs became individuals. I wanted the reader, if they were willing to stay in that place of presence and witnessing, to become engulfed, enthralled and enveloped with prairie dogs, as well. KS: Is that what you’ve heard from readers thus far? TTW: Well, if I count my father, who said that the prairie dog section is so boring that no one is going to finish it, and if they do, the rest of the book is such a downer they will be sorry they did. But I think there have been many other people who have understood it, and who stayed with it. I just had a woman email me who has started a prairie dog watch society—she’s outraged that this is a species that could become extinct within this century; she’d never known that before. KS: It all matters, doesn’t it? A cynic might say, “Well that’s very solipsistic,” but I get the sense that you begin there and you light from it very quickly. TTW: Well, we’re human, this is our world, and I think we learn that that which is most personal is most general. And so, in a sense, we disappear into this larger world. I had a very dear friend, an amazing writer who I admire greatly, who said, “Terry, you cannot publish this book. You cannot compare the plight of prairie dogs with the Rwandan genocide, you can’t do it.” And I wrote back and said, “You know, I understand the risks, but the extermination of a species and the extermination of a people are predicated on the same thing: prejudice, cruelty, arrogance and ignorance. And if we can’t make those connections, if we can’t begin to see the world whole, even holy, I think we’ll continue to live in this fractured, fragmented state that is this seedbed of war. KS: It reminded me John McPhee’s essay “The Search for Marvin Gardens,” which equates the former glory and dilapidated present of Atlantic City to the playing of the Monopoly board game. We can see it as a diminution, or we can see it as another way of understanding, a way of relating something that may be far away to something that we know. TTW: I’m just haunted by our capacity to avert our gaze. When you think about it, there were once five billion prairie dogs in North America; there are 10,000 Utah prairie dogs left now—that’s it. They’re so vulnerable and then you wonder, what were we doing in 1994? America was debating at the United Nations, whether or not these acts of violence in Rwanda constituted “a genocide.” Meanwhile,while we were discussing semantics, one million Tutsis were slaughtered. I was thinking about the power of language, the power of the words “vermin,” “varmint,” “Tutsi,” “cockroach,” “genocide.” Genocide wasn’t even in our vocabulary until 1943, two years before World War II was over. Language has the power to influence our actions, to change our consciousness. Empathy, resiliency; these were the words I was using to create an alternative story in terms of a literary mosaic. KS: On the idea of “mosaic,” I’m really interested as to how you reconcile as a writer this struggle between the personal and public, because it seems to me you deeply value your connection with other people, and yet the art you practice is a solitary one. TTW: It is a struggle, and the people who are closest to me know I am a very private person. I’m an introvert, and yet, because of my passions about landscape and community, it propels me into a public sphere. And that’s what democracy requires of us, to participate, to engage. So you have to be fluid and you have to be present but, as my friends and husband and family will tell you, when I’m writing, I’m not available—no one knows where I am. I disappear. I have a real gift for it, you know? I really know how to disappear; I don’t care about email, and I don’t have a cell phone; wherever I am, I’m there 1000 percent and when I’m gone, I’m gone. All writers have their own survival strategies in how they manage to carve out time to create. I do try to construct a life that has boundaries: I teach in the fall. In winter, I try to be quiet, and that’s when I write. In the summer, I just love being out in the desert or mountains, and that’s family time. But nothing is as clean and neat as that, as you well know. KS: How do you feel about the term “nature writer,” someone who writes about nature? TTW: I’ve seen my books catalogued in libraries in every section imaginable, including occult, so I don’t really worry about the definitions. I don’t know how to think in boxes, and so none of my books have been single-subject, so to speak. I think of my books like ecosystems, where boundaries are fluid, not fixed, and I guess that’s how I see the world. As a writer, I am interested in patterns and semblances. KS: Does that definition, to your mind, place you within a continuum of other writers? Do you have literary grandmothers and grandfathers? Siblings? Children? TTW: I know the writers that have mattered to me, that continue to matter to me. Certainly Wallace Stegner, his elegance of language about the American West. Edward Abbey was also important to me—I had the pleasure of knowing him and walking with him in the desert. He was fierce and irreverent. You never knew what was going to happen when you were with him. I recall him saying to me, “If you’re only getting good reviews, you’re not pushing yourself as a writer, you’re not pushing the culture enough.” I’ve never forgotten that, as a writer it is our obligation to disturb the status quo and to widen and deepen the conversation. And Rachel Carson, of course. I remember in 1962—I was in the second grade and we were outside in my grandmother’s yard—she was feeding the birds and she said, “Can you imagine a world without birdsong?” For her, that was not just a metaphor, it was a reality, and that potential loss was embedded in my mind and my imagination. I would also add Helene Cixous, Clarice Lispector, Virginia Woolf, J. M. Coetzee, and John Berger, as other literary mentors. 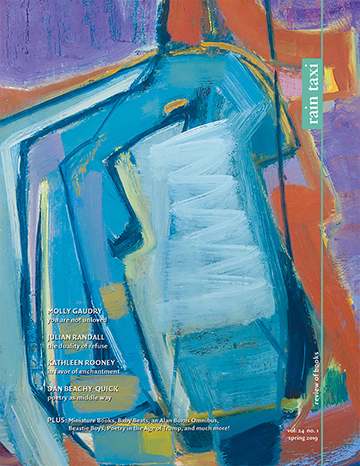 And many poets from Denise Levertov to Muriel Rukeyser to Rexroth to Milosz. Whitman, of course. KS: Do you read widely? KS: You have a great line in Refuge that says, “We don’t pick our obsessions, our obsessions pick us.” Do your admirers demand you return to the topics you’ve written about whether you want to or not? I’m sure people still ask you about “Cancer” and “The Great Salt Lake,” things like that. 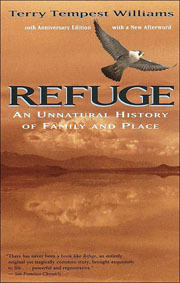 TTW: It’s funny, just recently, I was asked to talk about Refuge in Salt Lake City at Westminster College. It was the first time in twenty years that I had been asked to speak about this book at a college or university in my home state of Utah. KS: How do you know when one project is over and the next one begins? TTW: You know, I don’t think of my books as projects. I think of them as questions. It’s the questions, I swear, that I’m obsessed with. I think I know it’s over when I’m holding my manuscript in hand and my editor says, “You cannot revise anymore.” But I make great friends with the copy editor and the copy editor’s assistant, so at the last minute I can still revise. My editor signed off on this book in January of last year, but I was still rewriting in June. I love the revision process. For me, that’s when a book begins to shine. KS: But if you have a body of work like you do, someone can come back and say, “Ms. 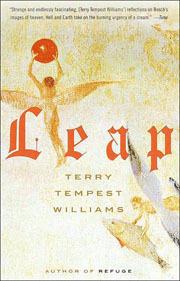 Williams, I’ve just gotten around to reading Leap and I’d really like to talk to you about Hieronymus Bosch.” Are you tempted to say, “I’m not doing Hieronymus Bosch any more”? KS: What did you say? TTW: Nothing, I just cried. You know, you do your work and you don’t know what the outcome is going to be; those are the acts of faith, and writing has always been a process of discovery. And in that sense, I think, these books don’t belong to me; they just have their own life in the world, like water. KS: I got the sense from Finding Beauty that you’re a person of many talents and interests, and I’m interested to know how you settled on writing as the primary mode by which you would express that. TTW: I love my freedom and writing, honestly, is the only thing I can do that sustains that kind of freedom and that holds the magnitude of my curiosity. I think writing is always ahead of us and it draws us forward into unknown places. And I love that, I love not knowing where I’m going, I love that feeling of being overwhelmed, realizing I know nothing. I must have read a hundred books on Rwanda. I have a whole library on prairie dogs, a library on Philip II in Spain when I was writing Leap . . . it’s really the way I educate myself. KS: Much of your writing seems to come from a place of wonder and possibility, yet one that is well researched. There’s nothing I like better than learning things, and yet the amount of information we have available to us—the sheer amount of things a curious person can be curious about—is incredibly large and can create a lot of “din in the head,” as Cynthia Ozick would say. So how do you stay a well-informed person with the things you care about and yet not suffer from information overload? TTW: I’m thinking of footnotes, but I don’t know why. In Leapthere’s fifty pages of footnotes, all these back-stories, and at the last minute of the last hour, I did the same thing with this book. To me, it’s all part of this associative life. I realize I can never know enough; I don’t know anything. But it is the attempt to see the connectedness of all things, the pursuit and possibility of a patterned life. At the very least, I follow my instincts and immerse myself in the questions that obsess me. KS: I’ve often thought that in a world where there’s too much to learn and where everybody has to be stuck in their appropriate cubbyhole, there’s too little communal experience. The closest we come is things like presidential elections, things like September 11th. And the solace I take in that is that if everybody is an expert on his or her own little square of ground, it means we often know nothing about a lot of the rest of it. And so, the commonality we have is not what we know but what we don’t. The shared communal experience is the process of learning, itself. TTW: And I love that, because to me, what’s most compelling now are the questions, not the answers. I think if we can ask the right questions then we’ll be heading in the right direction. It also occurs to me that, in my time with my students, the thing that they are most hungry for is experience. We’re so tied to the Internet, to the virtual and abstract, that two weeks with prairie dogs now seems unusual. That’s no time at all, but in the scheme of our distracted lives, it’s a lot because our days are so fragmented. How long do we ever really concentrate or have a sustained moment of focus? To have an hour where we’re not on the phone, where we’re not checking email—I think people are hungry for communion, whether it’s with the land, or another person. And it goes back to presence. To me, that is the definition of the sacred—that you are fully present with the person you are with and that you know you are being met with the full capacity of that other person. To be seen, to be heard. The art of deep listening is what creates compassion. KS: In Barack Obama’s The Audacity of Hope, he talks about fifty years ago, when people as politically different as Senator Robert Byrd and Senator Ted Stevens used to fight like cats and dogs on the floor of the Senate and then go out and have drinks afterwards. Now it seems like there’s an orthodoxy to progressivism that is as destructive as the narrow-mindedness on the other side of the political spectrum. TTW: That’s why I’m so grateful for my family, because they’re constantly challenging me. The question I keep asking myself is, “If I’m interested in a change of consciousness, how is my own consciousness changing?” And I think if we really want this country to change, how must we change ourselves? This is a time of tremendous transition. We need to be gentle with one another as we make these radical shifts of behavior toward a more sustainable world, a world responsive to climate change, poverty, economic disparities and ecological health. It reminds me, going back to the mosaic, that it’s bits and pieces; how will we put them together to find this common whole? In that sense, I think this is such a beautiful time of opportunity and creativity to create these new assemblages, you know? And again, what motivates us? I think it’s heartbreak. How do we live and love with a broken heart? To me, that’s always the question. This entry was posted in Uncategorized and tagged winter 2009 on November 20, 2013 by admin.